Interesting find today; a handwritten legal document from 1814 from Portage County, Ohio. The main parties involved appear to be John Graham and Roswell M. Mason. 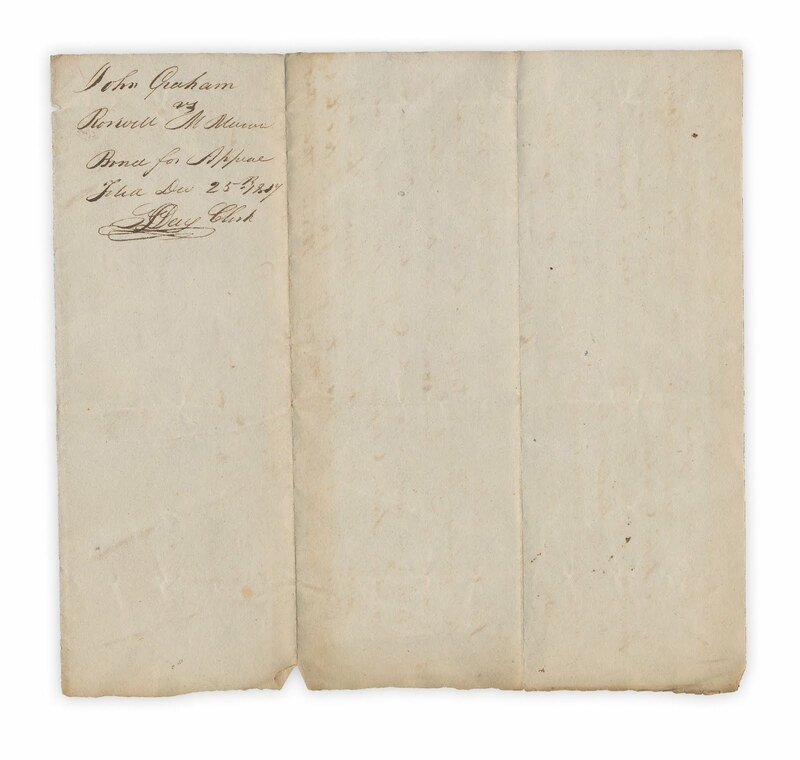 I wasn't able to find out much about Mr. Graham, unless he is the John Graham that helped settle Stow, Ohio or the John Graham that killed Levi Odell in 1830. ...In the spring of 1803 Mason with his two sons, Roswell M. and Peleg S., lads of seventeen and nineteen, and Tilden and Hutchinson, came out, leaving their families at home, and made improvements on their lands, Mason clearing about 22 acres and putting it out in wheat, and building a cabin. Hutchinson also cleared twenty acres and built a cabin; Tilden, in like manner, clearing and building. Shortly after they came they discovered and named Silver Creek. They all then went back and were preparing to come out permanently the next spring, but the two sons of Mason refusing to again go into the wilds of the Reserve, the father was compelled to change his plans, and he purchased a farm in Vermont. This action of Mason induced the others to forego for the time emigrating Westward. Three of their hired men, however, were pleased with the country and concluded to settle here. They were Richard Redden, Jacob Wirt and Samuel Wirt, from Pennsylvania. Flemings, also becoming discouraged, concluded to leave when he found that Mason, Hutchinson and Tilden were not coming, and he sold his place to Redden, the Wirts at the same time settling on the east half of Lot 38. 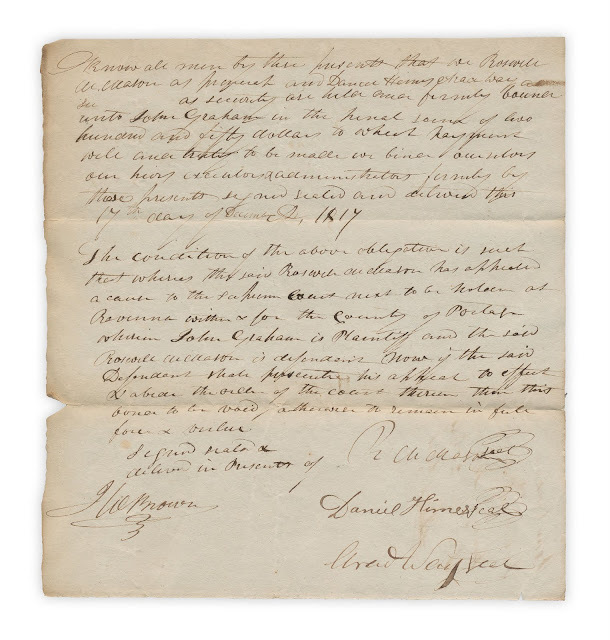 Redden sent for his father and family, which was the first white family to winter in the township. ...In 1806 Roswell M. Mason had a change of heart in regard to the Western country, and came from Vermont to settle on Lot 32, which had been given him by his father. His father owned considerable land here and Roswell was made agent for it, but instead of settling down to the life of a farmer, hired others to improve the land, and studied law. Medina County was formed from the Western Reserve February 12, 1812. The surface is rolling and the soil is fertile, producing fine agricultural products. The first trail made through the county was made by George Poe, Joseph H. Larwell and Roswell M. Mason. Here is the text of the document. Please note that normally I wouldn't have even bothered with this, as I am unable to decipher the writing. Luckily, I have the talented Sara to figure it out. The condition of the above obligation is such that whereas ??? Roswell ??? has appealed a cause to the Supreme Court next to be ??? as Ravenna written & for the County of Portage wherein John Graham is Plaintiff and the said Roswell M. Mason is defendant. Now if the said Defendant prosecutes his appeal to effect ??? the order of the court therein than this bond to be void, otherwise to remain in full force & virtue. Found in "The Science of Language" by Abel Hovelacque. 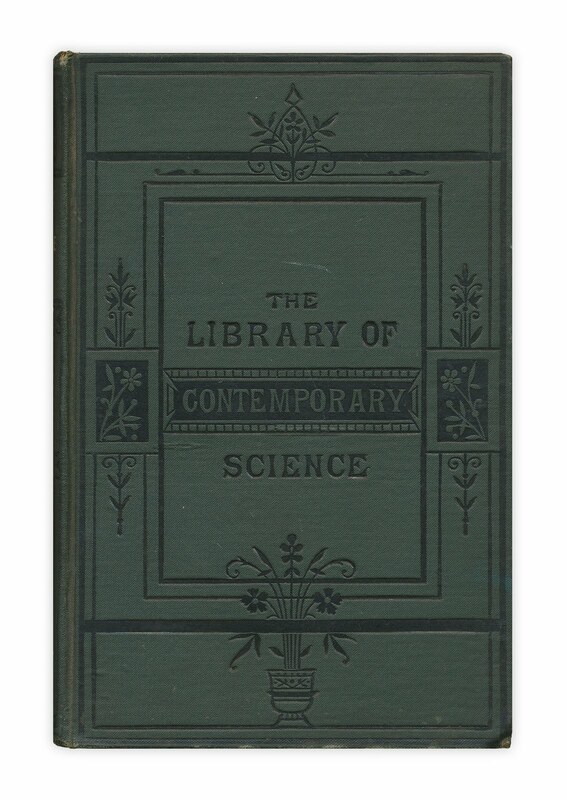 Published by Chapman and Hall, 1877. Thanks for all that research you did! this is so cool! I live in Portage County, OH, and am about 30 minutes from Stow and about the same from Hiram Twp., which is now part of Geauga Conty. Excellent desription of the land... even though it's a bit more developed these days. Second set of ??? might be Mrs. Levi Roswell. The final question mark is "Day Clerk" which may be the scribe's office.